Summary: The warm fall day starts like any other at the Center—a women’s reproductive health services clinic—its staff offering care to anyone who passes through its doors. Then, in late morning, a desperate and distraught gunman bursts in and opens fire, taking all inside hostage. I'm afraid it's the second week in a row that I am reviewing a book that didn't really resonate with me. 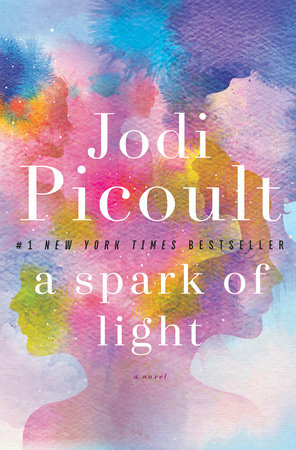 This time it's A SPARK OF LIGHT by Jodi Picoult. I will admit that I was a bit reluctant to pick up this book after learning my good friend Kathy's (aka Bermudaonion) opinion; however, I was intrigued by the idea of tackling the controversial subjects of women's rights and abortion. A SPARK OF LIGHT tells the story of what happens one tragic day when an armed man enters a reproductive health services clinic and opens fire. The novel follows the stories of some of the people in the building that day as well as the policeman negotiating with the gunman. Hugh McElroy is a hostage negotiator who is trying to calm down the gunman. Ironically, Hugh's teenage daughter and his older sister are actually in the center although Hugh doesn't share this with the other cops. There are also nurses, doctors, patients and even a pro-life protester in disguise whose lives are at risk! Through the lives of the gunman, the police negotiator, and realistic people on both sides of the abortion argument, this novel explores abortion like no other novel I've read. Set in the very conservative deep south, the book also tries to balance the women's rights issues versus the religious right's beliefs about the sanctity of life. Of course, there are no easy answers to this issue of abortion; and I do believe that A SPARK OF LIGHT did a good job of featuring all sides of the argument. However, I can't really say that I enjoyed the book. It just didn't work for me and I'm the first to admit that I might be in a reading funk because this is two books in a row that I had issues with. Having said that, I didn't really appreciate how the story was told. The chapters worked backwards in time during that tragic day, and I found it a little unsettling and sometimes confusing. Of course, it was probably the author's intent to make the book a little uncomfortable for the reader! In addition, there were just too many characters for me to follow. I think it was around ten or so. I understand that Ms. Picoult wanted to show many sides of the story, but for purposes of this novel, it was a few to many. There were some characters that I was definitely intrigued by, and I kind of wanted more about them and less about others. All in all, though, A SPARK OF LIGHT would make for an interesting book club pick... for certain book clubs. I'm not saying that the book doesn't address some important issues but I'm not sure I want to go there with a book club if you know what I mean! There is an excellent reading guide with nine thought-provoking questions. Some of the themes you might want to think about include women's health, privacy, strength, difficult choices, and of course abortion! I'm not sure that A SPARK OF LIGHT is for every reader, but there's no doubt that it delves into a much-needed discussion topic. I received an ARC of this novel at the 2018 Book Expo. The backwards timeline didn't work for me, either. I thought maybe it was because I experienced the book on audio and it took me a little while to figure things out. This book was just okay for me. I may have liked it more than you did. But it's not one of her better ones. My favorites are The Storyteller, The Pact, and My Sister's Keeper. And Small Great Things(?) was very good too.